We can’t prove it, but we’re roughly 86% sure that someone has popped a couple of massive Duracell batteries into Steve Hackett’s back. Perhaps due to the Genesis legend’s affable and unassuming demeanour, the frankly insane levels of activity that the now 68-year-old has been putting in over the last decade (and, in truth, for many years before that) are seldom remarked upon with the intensity they deserve. Seemingly on the road more often than not – and, as was the case earlier in 2018, occasionally with a full orchestra in tow – but wonderfully prolific in the studio too, he has slowly but stubbornly re-established himself as one of the prog world’s most vital forces. Whether playing classic Genesis material or his own authentically successful recent solo material (2017’s The Night Siren was an unlikely top 30 hit in the UK album charts), Hackett is clearly riding a unique wave of creativity and accomplishment that has been a joy to witness. A new year brings the release of Steve Hackett’s 26th solo album, At The Edge Of Light. As with most of his recent records, it’s a bewildering but endlessly fascinating tour-de-force of progressive ideas, spine-tingling melodies and bravura musicianship, delivered by a synapse-melting list of rock, prog and world music luminaries, with Hackett sharing the spotlight with typical humility. Almost certain to emulate The Night Siren’s unexpected chart success, it’s an album that Hackett seems to feel he has plucked from the ether, as inspiration arrived from all directions. The most obvious result of this open-ended approach to composition is that At The Edge Of Light sounds quite unlike anything else happening in music right now. At times mischievously esoteric, with sounds ranging from the expected wall of guitars to sitar, cimbalom and (as Hackett notes with a chuckle) “drums put through a Marshall cabinet”, the album boasts many changes of mood, but the overriding feel is one of wide-eyed joy at music’s kaleidoscopic potential. And does he think he will? From the folksy gloom and soaring leads of Beasts Of Our Time and the blues-tinged clangour of Underground Railroad to its dazzling three-part finale, Descent/Conflict/Peace, At The Edge Of Light covers so much musical ground that, in less capable hands, it could’ve been a complete mess. Instead, it borders on a connoisseur’s guide to prog, both ancient and modern, replete with one song – Under The Eye Of The Sun – that boasts some gloriously vocal harmonies straight out of the Yes handbook. One specific example of Chris Squire’s now distant but essential influence on Hackett’s musical life is that the much-missed legend cannily foresaw his fellow musician’s large scale orchestral endeavours. According to Hackett, Squire once pointed out that he was the only guitarist he knew that had a sufficiently robust ego that he genuinely enjoyed the idea of being surrounded by so many musicians. Perhaps more so even than its recent, much-hailed predecessors, At The Edge Of Light is an album that celebrates the very notion of creative cooperation. A quick glance down the album’s remarkable roll call reveals contributions from Nick D’Virgilio (Big Big Train/ex-Spock’s Beard), Jonas Reingold (Flower Kings/Karmakanic), Simon Phillips (The Who/Toto), Pink Floyd vocalists Durga and Lorelei McBroom, sitar guru Sheema Mukherjee, saxophonist Rob Townsend and, of course, Hackett’s brother John: a mainstay of his live and studio work for decades. With several other eclectic protagonists thrown into the mix, it’s very much an album of ensemble and individual performances, all tastefully glued together with Hackett’s low-key charisma, elegant vocals and scorching leads. An heroic team effort, if you will. It’s not hard to see how the late blossoming of Steve Hackett’s solo career has stemmed directly from his own delight at all the incredible musicians that are, not entirely surprisingly, rather eager to get involved. As he describes it, the long journey from adolescent dreaming in the 60s to nailed-on icon status has been fuelled by a profound and deep fascination with what other musicians can do and how that, in turn, could make his own music bigger, better and more enduring. 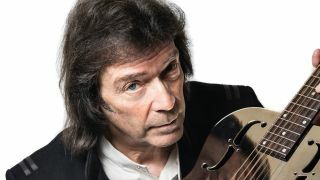 If you caught Steve Hackett’s Genesis Revisited: Band with Orchestra tour earlier in 2018, you won’t require any further evidence that the guitarist is thoroughly enjoying expanding and exploring the more ambitious end of his repertoire. Today, he admits that the experience has fed directly into At The Edge Of Light: not in terms of specific orchestral embellishments, although there are plenty of those too, but more in terms of providing a fresh perspective on what is generally some very complex music. One of prog’s most reliably adventurous souls, Steve Hackett has always assimilated a dizzying array of disparate influences into his music. It’s clear evidence of an open-minded approach to life that is also routinely reflected in his lyrics. Often world-weary but never devoid of hope, Hackett’s worldview is another element that makes his music so inclusive. On At The Edge Of Light, the grim spectres of war, conflict, social division and needless suffering all loom large amid the record’s darker moments, and while he is reluctant to stick his head above the parapet to make specific political declarations, it doesn’t take a genius to work out where he stands on the likes of Trump, Brexit and the rise of the far-right. So does it feel even more important, at this precise moment in time, that At The Edge Of Light is such a proudly international record? But does this album feel like a protest of sorts? It’s certainly unequivocal about rejecting much of what’s happening around the world at the moment. Communication is at the very heart of everything Steve Hackett does: communication between artist and fans and, between one musician and countless others. It might sound like a load of old hippie nonsense, but advocating an ethos of peace, love, compassion and hope is always something to be saluted. As he points out, it’s just a shame that the world has taken such an ominous turn, making troubled but emotionally uplifting records like At The Edge Of Light all the more necessary. Despite the daily horror of the news, Steve Hackett is definitely having fun. At The Edge Of Light will emerge in January, presaging yet another extensive tour which takes in most of Europe, Canada and an impressive 20 dates in the UK. There aren’t many rock veterans putting in that level of effort at this stage in their careers, but then most musicians aren’t as profoundly happy with their lot as Steve Hackett. Thrilled to be both a relevant, contemporary musician and guardian of the Genesis catalogue, he simply can’t wait to get back out there. His enthusiasm is infectious, his energy boundless. Maybe our Duracell theory is nonsense after all. All Steve Hackett needs to power him through another 12 months of triumph is the greatest energy source of all: music itself. Let the happiness and healing begin.